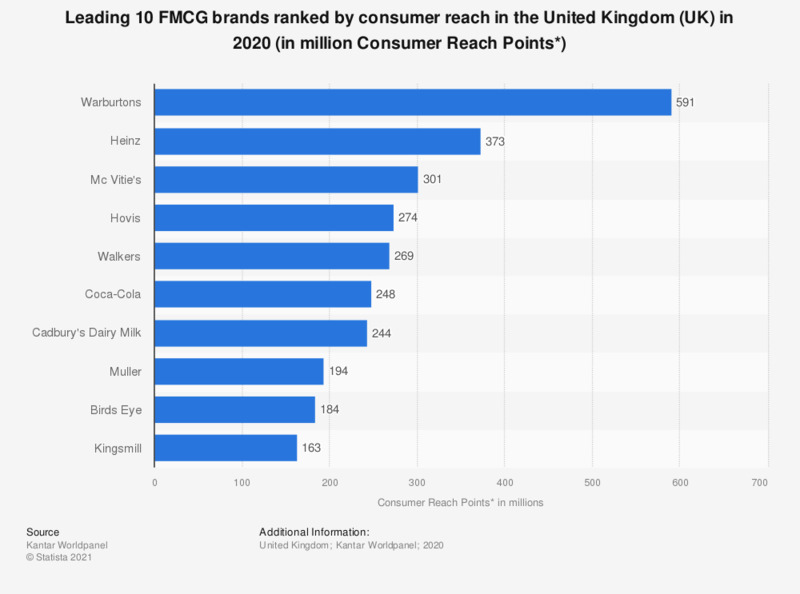 This statistic shows the leading ten fast moving consumer goods (FMCG) brands in the United Kingdom (UK) as of 2017. That year, Warburtons ranked highest with 544 million consumer reach points, followed by Heinz with 365 million points. Fast moving consumer goods refer to products that are sold quickly and at a relatively low cost. Products categories include soft drinks, toiletries, over the counter drugs, processed foods and a wide range of other consumables. These products are normally sold in large quantities and sometimes have a short shelf life. Ranking in first place, Warburtons is one of the UK's leading bread brands . The company was first started in 1876 and continues to be a family run business. Heinz, the UK's second most chosen FMCG brand, is an American-based company, founded in 1869. In 2015, Heinz merged with the Kraft Foods Group to become The Kraft Heinz Company. Ketchup is one of the leading products of Heinz and is highly popular in the UK. In 2017, condiments and sauces accounted for 50 percent of The Kraft Heinz Company's worldwide sales. 1. Population: the number of households in a country. 2. Penetration: the share of households buying a brand. 3. Consumer choice: the number of interactions with a brand across categories in a year.